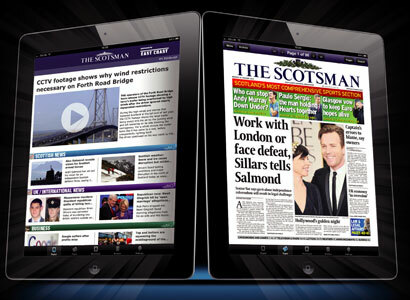 The Scotsman is today launching a £7.99-a-month iPad app. The app, which will be free for the first 30 days, is aimed “to appeal to regular readers, subscribers and scotsman.com users, and offers the opportunity to grow readership amongst iPad users, business travellers, sports fans, expat Scots and commuters”, according to a release. The Johnston Press-owned title added in the release that this is “Scotland’s first dedicated multimedia news iPad app”. This is a major development which keeps the Scotsman up to speed with the latest media technology. Devices such as the iPad will play an increasingly dominant part in the way people access information and this is one of the most important steps forward in the Scotsman’s 200-year history. It is a very different experience to reading online and having been at the forefront of that newspaper revolution over ten years ago it is fitting that we are in the midst of this one. The app is sponsored by train company East Coast for the first four months. This entry was posted in Design and graphics, Mobile and tagged ipad apps, Johnston Press, The Scotsman on January 24, 2012 by Sarah Marshall. The Guardian iPad edition has been downloaded more than half a million times since it launched in October 2011, with 23,000 downloads on Christmas day alone. The Guardian has not released figures for the number of editions downloaded. 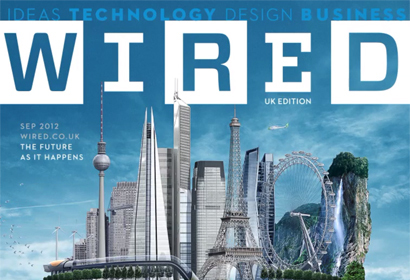 From Friday 13 January iPad readers will be asked to pay £9.99 for a monthly subscription. Content has been free of charge for users in the first three months since launch, due to a sponsorship deal with Channel 4. From tomorrow (Saturday 7 January) the app will include the Guardian’s Weekend magazine for the first time. The new weekly section, accessible from the app’s top navigation bar, will feature content from the Guardian’s award-winning magazine supplement, including columnists and recipes. The release also states that Guardian six- and seven-day print subscribers will continue to receive free access to the app after the three month period via their current subscription. Users who download the app after 13 January will receive a week’s free trial before signing up for the monthly subscription. This entry was posted in Mobile and tagged ipad apps, The Guardian on January 6, 2012 by Sarah Marshall. 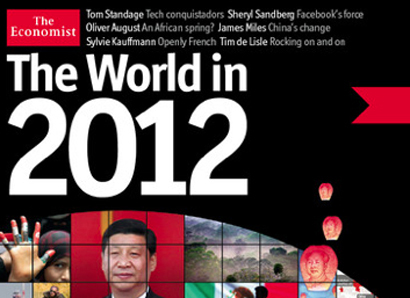 The Economist has today announced the release of an iPad version of “The World in 2012 from the Economist: Editor’s Highlights”, based on the annual magazine which features predictions, graphs and charts for the coming year. The featured articles focus on a variety of topics ranging from the areas of technology still up for grabs, the power of sharing and the change in China’s leadership. The videos include an extract of an interview with Facebook’s Chief Operating Officer, Sheryl Sandberg, as well as interviews with people from New York, Beijing and London on the coming year. The application also contains a feature on 12 people to watch in 2012, a month-by-month selection of events in 2012, a snapshot of 12 titbits to look out for in the year ahead and a collection of charts, graphs and data. This digital introduction makes it clear to new readers why the publication has become so popular over the past quarter century. This entry was posted in Magazines, Mobile and tagged Economist, iPad, ipad apps, tablet on November 24, 2011 by Sarah Marshall. The Independent has today launched a revamp of its website, the same day as it released a new iPad app . The site redesign follows a makeover of the layout of the print edition of the paper and a new masthead and also takes place in the same month the Independent launched a metered paywall outside the UK. We have introduced greater flexibility in our use of images. This not only means a homepage and channel pages that can better reflect the variance of our daily coverage, but also a more dynamic use of images in articles. There is a smoother and more flexible integration of video that better matches the YouTube and 24-hour TV world. There are clearer ways to express yourself – comment on an article, share it with your Facebook friends or Tweet your view about it. Meanwhile Jack Riley, our head of digital development, has devised some further advances. These include: a new tagging system for the site; dynamic pages for all of our writers; and a more intelligent automated system for related content. We’re also extending our use of Facebook’s Open Graph to include more topic pages and all writers. His article will follow shortly. The most recently released ABC-audited web figures show Independent.co.uk had 14,675,273 unique browsers in September. The Independent’s new iPad app is free for an initial trial period and will then charge users £19.99 a month for access to “premium” digital content from the Independent and Independent on Sunday. This compares to £9.99 a month for the Guardian’s new iPad app, which provides content six days a week as it excludes the Observer; £9.99 for the Times iPad edition, again providing content six days a week; and £9.99 a month for the Telegraph iPad app which, like the Independent, provides content seven days a week. This entry was posted in Design and graphics, Online Journalism and tagged Independent, ipad apps, Jack Riley, martin king, website redesign on October 31, 2011 by Sarah Marshall. Lost Remote has an interview with global head of mobile at Bloomberg Oke Okaro on the TV channel’s new iPad app, which was released yesterday. The free app allows any iPad user to stream Bloomberg TV’s full 24-hour broadcast over WiFi or 3G. Bloomberg’s decision to make their TV content available to any iPad user sets an extremely innovative precedent in a TV world dominated by [US cable television] network-MSO relationships. While the app’s main focus is video, users can also get live market data and related news for companies mentioned in videos. You can customize Bloomberg’s familiar scrolling ticker. Other added features include the ability to watch in landscape or portrait, download videos for offline viewing, search the content library, schedule reminders for upcoming shows, and share via social networks. This entry was posted in Broadcasting, Editors' pick and tagged Bloomberg, ipad apps, Lost Remote, television broadcaster on October 28, 2011 by Sarah Marshall. The Guardian’s new iPad app has been downloaded 145,880 times since it was launched last Thursday (13 October), with more than a third of those from outside the UK. The app is free for the first three months due to a sponsorship deal with Channel 4, after which it will cost £9.99 per month. The Guardian also today revealed that just over a million Facebook users have installed the Guardian’s Facebook app, which was released exactly a month ago. Since its launch at the beginning of the year, the Guardian’s iPhone app has been downloaded over half a million times; its Android app, which was launched last month, has been downloaded over a quarter of a million times. 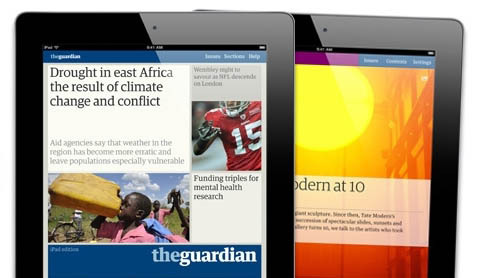 Since launching last week, the new Guardian iPad edition has already been downloaded over 145,000 times. This number of downloads in a week is a fantastic achievement, and shows the appetite among our readers to access our content in new, digital ways. This is our most successful app launch to date, and an important milestone as we continue to evolve into a digital-first news organisation. Since launching in January this year, the app has been downloaded over 570,000 times, with nearly 100,000 users going on to take out subscriptions. This launched last month, on 7 September, and since then the app – which is free and ad-funded – has been downloaded over 250,000 times. This entry was posted in Mobile, Traffic and tagged android apps, facebook apps, iPad, ipad apps, iphone apps, The Guardian on October 21, 2011 by Sarah Marshall. Today’s session on tablet applications at the World Editors Forum featured a fantastic presentation by Mario Garcia, CEO and founder of Garcia Media, who ran through 10 incredibly useful lessons to learn when creating news apps. 1. Tell stories across platforms. “We must think in terms of a media quartet”. 2. What the tablet is. “A tablet goes beyond, to create an immersive experience, not a newspaper, not an online edition, not television, yet has the abilty to fulfil the role of all these platforms together”. 3. The lean-back platform. “You have got an audience that’s relaxed, but not that relaxed. At any point they want to know what’s happening now”. 5. Covering three tracks. “Users want their newspaper tablet apps to have the three main tracks of curated edition, news updates and e-readers”. 6. The tablet and design. “You have to make it sophisticatedly simple”. 10. You must consider a curated edition. Have an editor to curate the edition. This entry was posted in Events, Journalism, Mobile and tagged #wef11, apps, Garcia Media, iPad, ipad apps, tablet on October 14, 2011 by Rachel Bartlett. After taking its time in development the Guardian has finally announced an iPad app, which is coming “any day now” apparently. According to editor Alan Rusbridger, the app will not focus on breaking news but be a “more reflective” read. We’re not going to be scrambling to update it every minute or every hour. We will do that on the browser, the browser is a place to go for liveblogging and to go searching for material, but this is going to be a different kind of read, it’s going to be more reflective. It seems like the thinking behind the app will take it away from the web browser experience and closer to what Guardian has in mind for its print edition. Although producing a static, print-like app may seem a little strange for a “digital-first” news organisation (especially one that creates a promo video for its app criticising the idea of “recreating the newspaper on the iPad”), it’s a move that makes sense in many ways. It looks at the tablet as more of a lean-back device for evenings, which research by Bit.ly and others has shown is a popular time for iPad use, something to supplement breaking news on Guardian.co.uk and via the iPhone app. The app will be free for the first three months after launch thanks to a sponsorship deal with Channel 4, after which it will cost £9.99 per month. Six- and seven-day print subscribers will get access to the app bundled with their deal, although the app won’t include content from the Observer. This entry was posted in Design and graphics, Handy tools and technology, Mobile, Newspapers and tagged apple, iPad, ipad apps, Mobile, The Guardian on October 10, 2011 by Joel Gunter. 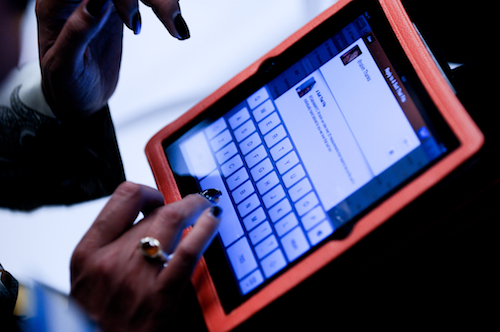 Poynter has an interesting post on SoundNote, an iPad app for recording interviews. It tells the story of how David Estes, a journalism student studying in Seattle, created the application, paid off his student loan with his earnings from the $5.99 app, and moved to a West Village apartment. The post explains how the app works. 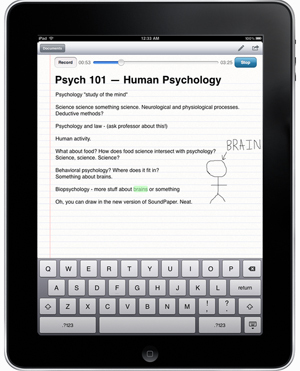 SoundNote is a simple note-taking application that lets you record from the iPad’s internal microphone. It matches your notes with the timeline of the audio recording, so you just click on a word in your notes to jump to the related point in the audio. If you’re interviewing someone, you point the iPad in the direction of your subject and jot down a few keywords as the person answers. It is also worth reading the post for the back story of how the app came about. Estes’ development of the app is a lesson in innovation. Instead of going through a formal process of soliciting requirements or getting multiple people to sign off on wireframes, a 21-year-old student thought about how a device like the iPad could make his life easier — as a journalist and student — and he just made it. The full post is on Poynter at this link. This entry was posted in Editors' pick, Handy tools and technology and tagged Audio, ipad apps, poynter, SoundNote on July 14, 2011 by Sarah Marshall.